The decompression time from Whitby Goth Weekend is getting worse! So chase away those blues with my belated reviews of the storming bands that filled the Spa for April 2016 WGW! 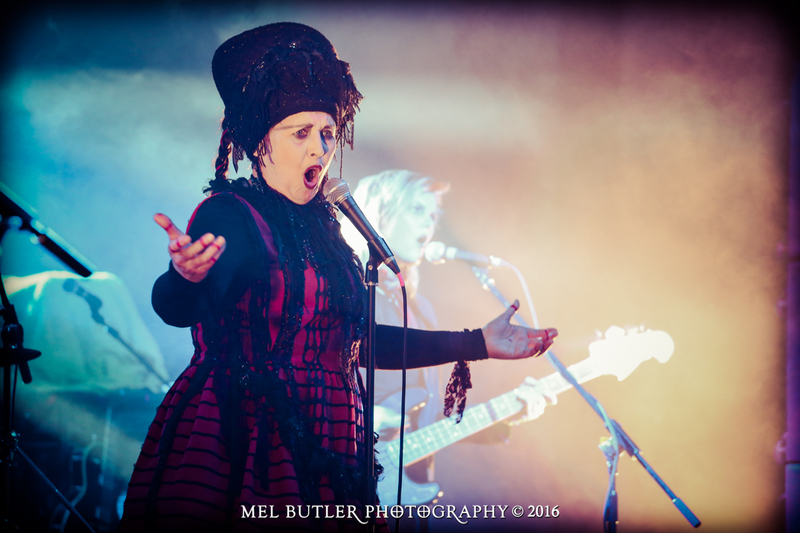 As always, my thanks to the talented Mel Butler Photography for choice pick of her quality pics! Definitely one of the most anticipated bands appearing at Whitby, Hands Off Gretel kick off the entire weekend with an absolutely explosive show! This grunge-punk band are on home turf, hailing from South Yorkshire, and they play with brazen self-confidence. Lauren heads up the band, red-dread riot-grrl style and skill with sultry singing. “Be mine!” she declares three tracks in, and the Spa roars in agreement, huge cheers for the opening act. Every song is a rock-and-roll hammer with a ripped-up punk attitude wrapped round the handle, pounding the floor and driving you to dance. They’re razor-sharp, keen and lean rock machines – check them out for a damn good foot-stomping night. They’re also lovely but I don’t want to rob them of their reputation! “It’s so nice to see an audience full of smiling faces!” declares Lauren. Wait, that’s us, smiling at a Goth gig. It’s our reputation in danger, due to enjoying Hands Off Gretel too much! Damn it! The lights are down low, and a mysterious swathed figure slowly crosses the stage to other worldly new romantic sounds. Suddenly the drums crash in, and the unmistakable sound of Lene Lovich’s voice floats across the stage! It is astounding – her unique, almost alien voice has not changed in decades, and it whirls without care though the notes and pitches. “What would I do without you?” She proclaims to an audience not willing to let her go, even after all these years. “You can’t kill me!” she declares imperiously and in an age of entertainment fatality it is refreshing to be reminded of the immortality of someone like Lene Lovich. Suddenly we’re into old favourite ‘Lucky Number’ – it is a perfect recreation of that unearthly hit from many years ago, an absolutely flawless production of that kooky hit! The audience is warm and appreciative, a grateful cheer for a golden classic contrasted with the raucous cheering for new bands! You can hear how this music was the inspiration for everything that followed; it’s smart, dark and punk-inspired music for intelligent rebels. It’s brooding and mysterious rock and roll. Lovich weaves it all together like the powerful witch in her music, casting an enchantment that bewitches veteran and newcomer fan alike. “Let’s go to your place” is the sultry invitation in their final song, and I defy anyone not to be excited by that invitation…! 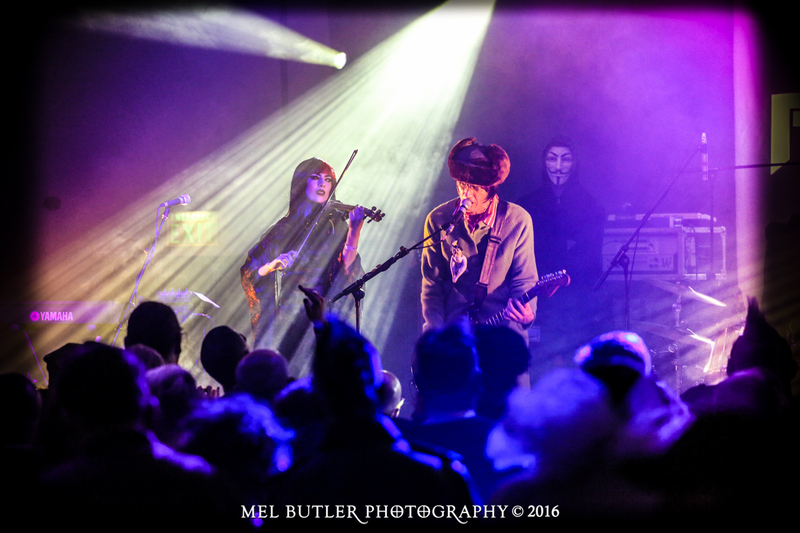 A welcome return for these worldwide alternative-rockers, The Red Paintings, with their gorgeous stage show and passionate, powerful music. Their elaborate pledge campaign hinges on their incarceration by an Anonymous-style subversive organisation – the dreaded TIME. So a rabid audience is tantalised with threats of withholding this wildly popular band – and they roar wildly when the lights come up and their heroes are revealed unharmed and ready to rock. And yet a looming masked figure stands imperious behind the lead singer, even as they unleash their powerful, heartfelt rock sound! Trash McSweeney on lead vocals and guitar can croon, can roar, can whisper and howl with the best of them. He’s passionate, enticing, and painful, bearing all in his emotional, heartfelt songs of raucous rock and roll. Backed up by violins and cello, the strings add an addictive aura of menace that off sets their energetic and emotional music. It gives it a menacing depth that inspires their loyal audience. They produce a very respectful and modern take on Nick Cave’s “Mercy Seat” – honoring the subversive legacy that came before them. A long-time Cave fan, I find it personally a fabulous and worthy cover. It’s vital, complex, multilayered music of loss, hurt and love – and the audience is hungry for every note and flawless word from Trash’s lips. There’s an accolade to Bowie which rings so true in this climate of unimaginable loss in music and creativity. Amidst that sadness, The Red Paintings are appreciated with rapture. 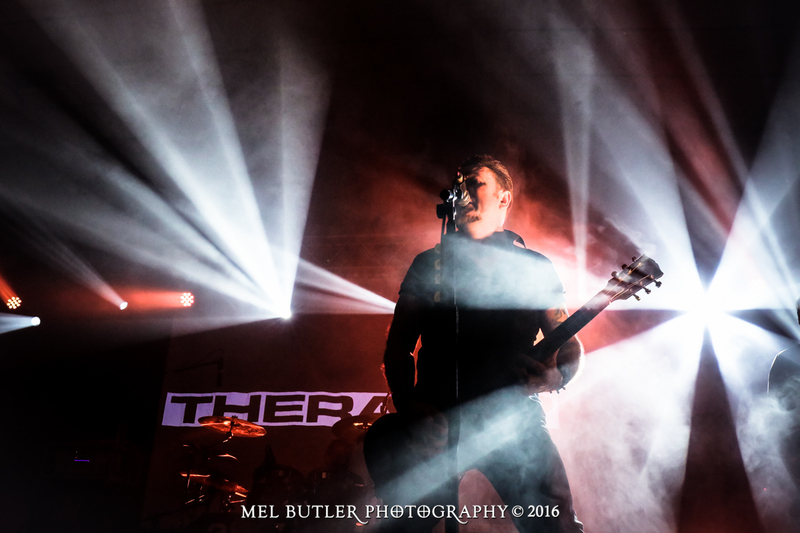 Crowning the first night of Whitby Goth Weekend are the wild card of the weekend – Therapy?, those metal legends from Northern Ireland. The band deliver a frankly merciless sonic assault. Its a full on guitar-led attack and the audience is ecstatic. They’re bouncing like crazy, as this veteran band passionately and effortlessly delivers the goods. Between every song, lead singer Andy is chatty with the audience – “Hello Whitby! Are you happy?” Surprisingly for Goths, they are, deliriously welcoming to this manic, jagged outfit. “I thought of you tonight” sings Andy, and a hundred hearts break. That’s how Therapy? works, snapping heart strings like guitar strings. The songs ebb and flow, a tide of passion and upset and raw emotional rock. It’s superbly authored and yet effortless in delivery. Stage-side, I’d been chatting with some crew – “Goths don’t form pits, outside of Sisters gigs” they declare authoritatively when I regard the potent crowd with a wary eye. Fifteen minutes later, they’re hurrying about, conferring with security as the audience coalesces into a good-natured yet aggressive knot at the front! They dedicate their song to every other band on the bill, especially Lene Lovich. “This is for when we listened to strange music and wore strange clothes – this is Happy Music!” To this the crowd bays and cheers along, and it feels like a football match of musical exertion. Finally they play TIDES, the new single with its video filmed here in Whitby. It’s a throbbing, surging anthem of bitter, hurtful and heartfelt love and loss. Everyone in the room connects it to some heartbreak in their lives. It’s unceasing; every song melts impossibly into the next, no matter how fiendishly complex the riffs. Andy is vocal in every break – “I CAN’T HEAR YOU WHITBY!” The room utterly explodes with passion at his provocation. There’s the bare minimum of encore request before the boys are back, strapped up and thrashing through more songs, then they hammer through Insecurity and nobody comments on the obvious irony. The gig is in the bag, Therapy? are welcome at Whitby anytime! Our review of the Saturday Night Live (Bands) is online now, and remember – the lineup for November 2016 has been announced! So get your tickets and accommodation sorted now! 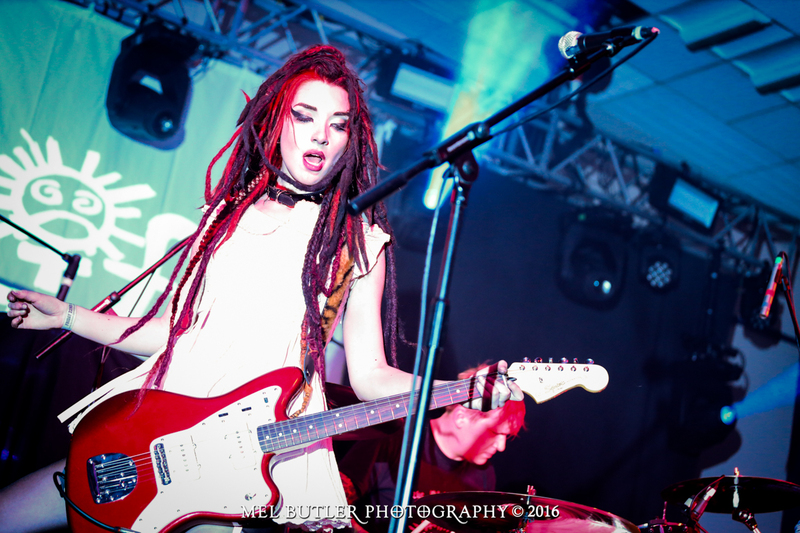 This entry was posted in Uncategorized and tagged band, bands, event, festival, links, music, review, UK Goth Festival, Whitby Goth Weekend. Bookmark the permalink.